In the political, social and economic turmoil of the early years of World War One, our community changed. Bitter debates over loyalty and patriotism, vandalism and theft of the Kaiser’s bust, unruly recruits from the 118th Battalion, and fears of economic loss over a “Made in Berlin” manufacturing identity, helped propel a name change few wanted, and for which only a handful voted. When the dust settled on September 1, 1916, we were no longer ‘Berlin’, but ‘Kitchener’. The city’s name change marked a defining moment in our history and identity – or did it? It has been said that “words have meaning and names have power” (author unknown). In this context, did the name change from Berlin to Kitchener hold historical significance or was it merely a casualty of wartime economics? Did we change as a community as a result of the name change or are we still Berlin at heart? Join us at the Central Library on Thursday 15 September 2016 at 7pm in the Theatre to hear University of Waterloo professors, Geoff Hayes (History) and Mat Schulze (German Studies) and local historian, rych mills, discuss the nationalist divides, local stories, and how the bilingual nature of Berlin/Kitchener affected the controversy. Carl Zehr, former mayor of Kitchener, will be the moderator of this panel discussion entitled, Von Berlin to Kitchener, Connotations and Cultures. It’s a free event and no registration is required. Click here for more information on the event. I’m looking forward to this discussion and I’m sure that you will too. If you are like me, you love postcards – especially old ones. There’s something about the combination of a phototograph, sometimes coloured, and a personal message on the back that intrigues me. It’s a window into a time, relationship or event, that gives a hint to the larger public and personal events in the lives of our communities, ancestors and neighbours. So when did postcards come about? In 1871, pre-paid government issued postal cards were introduced in Canada. They were printed on plain card stock and included postage. The backs were exclusively reserved for addresses and the other side for message. In the days before the widespread use and availability of telephones, postal cards enabled people to communicate with quick, efficient, and low-cost exchange of short messages, without the need of fancy stationary, envelopes and postage stamps. In large cities with multiple daily postal deliveries, recipients might receive and reply to a card on the very day of its dispatch. For several decades, these cards were the most popular and easy way to arrange meetings, advertise products and services, place orders with merchants, and keep in touch with family and friends. In the 1880’s, European publishing companies started including small illustrations on postcards, in conjunction with fairs and exhibitions. A new industry grew to fill the demand for these ‘private’ decorative postcards. In Canada, private postcards were accepted at a reduced postage rate of one penny starting in 1895. As time went on, the inclusion of pictures and photographs started to dominate the production of postcards. German companies were known for their high quality cards and illustrations and were a major player in the North American market until 1914. In Canada, companies such as James Valentine & Sons, Warwick Brothers & Rutter, W.G. MacFarlane of Toronto, Cloke and Son of Hamilton and International Stationery Co. of Picton were major publishers of postcards. Divided-back picture postcards, where the image is on the front and message and address sections on the back, were widely adopted in the early 1900s. With the development of camera for the masses, people were able to create their own postcards using their homes, families and communities as subjects. These postcards served to document and share personal and community histories, tourism and events. The ‘golden age’ of the picture postcards was from 1900 to 1920. So what do postcards say about the history of Kitchener? Local historian rych mills will tell us at his upcoming talk called “Postcards Then and Photographs Now”. Come join me on Thursday March 31st at 7pm at the Central Library as rych explores Kitchener history by postcards then and modern photographs taken by fellow history aficionado and Waterloo Historical Society member, John Glass. It’s a free talk, but registration is required. Details about the talk and registration link can be found here. You can also call InfoLink at 519-743-7502 to register during library hours. If you have Kitchener postcards, please feel free to bring them to the talk for rych to identify. As Pancake (also known as Fat) Tuesday has passed, I can’t help but keep thinking about food… so I’ve decided to do a bit of research on the Dietrich Bakery founder, Henry Anthony Dietrich to help satisfy my hunger. 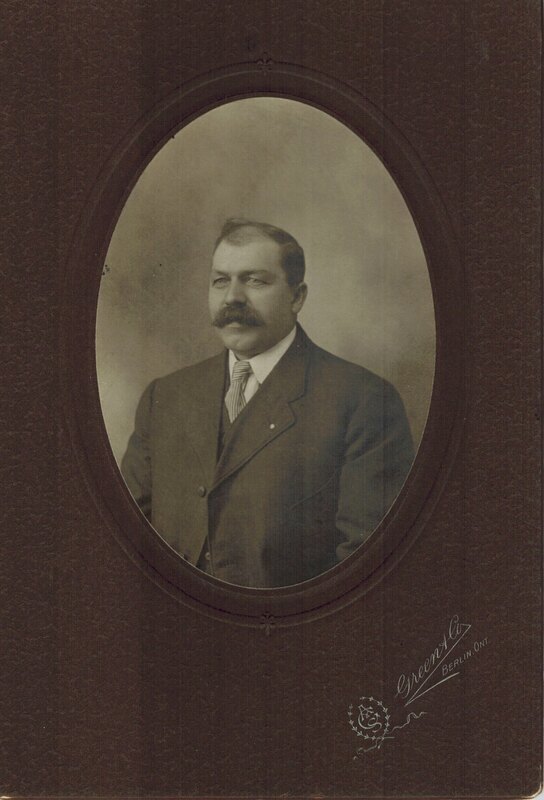 Henry was born on 17 April 1865 in St. Agatha, Ontario, the son of Mr. & Mrs. Gregory Dietrich. He was educated at the St. Agatha Separate School and spent his early years on a farm. He married Agatha Schweitzer on 26 May 1891 in St. Agatha. They lived for some time in Waterloo and later moved to Berlin in 1899, where he established a small bakery on Foundry (now Ontario) Street. 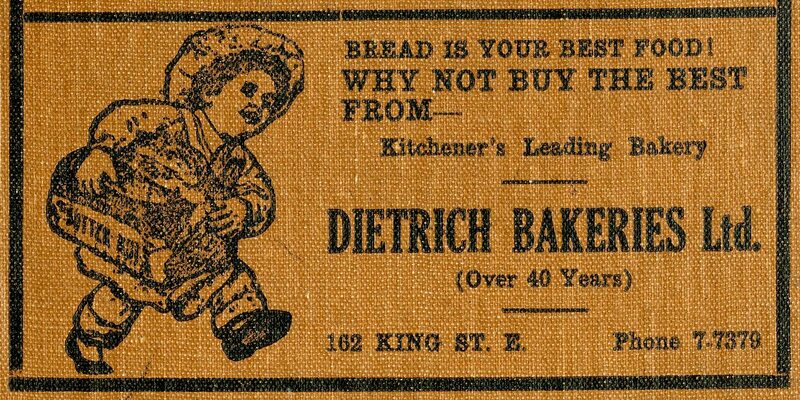 By 1906, Dietrich’s successful baking enterprise necessitated the construction of larger premises on King Street East. A large addition to the bakery was built in 1915, which resulted in one of the largest and best equipped bakeries in Canada. Dietrich also served as president of the Bread and Cake Makers’ Association of Canada. Henry also served as a member of Berlin Town Council, Waterloo County Council and on the first Berlin City Council in 1912. He retired from municipal politics in 1914. In addition, he was an active member of St. Mary’s Roman Catholic Church, Separate School Board and other church related organizations. Henry A. Dietrich died on 18 April 1920 of a sudden heart attack at his King Street East home. He was 55 years of age. Henry was survived by his wife, Agatha, one son, Robert, and four daughters, Florence, Alma, Coletta and Clara. His final resting place can be found in the St. Agatha Roman Catholic Cemetery. In my family, we’ve been having a number of birthday celebrations lately and cake seems to have been a recurring menu item in my household. A few weeks ago, as I stood in Norris Bakery on Frederick Street, waiting to pick up a birthday cake, I noticed photographs of the Dietrich Bakery on the wall. Curious, I rediscovered these photographs in the Waterloo Historical Society collection and wanted to share them with you. 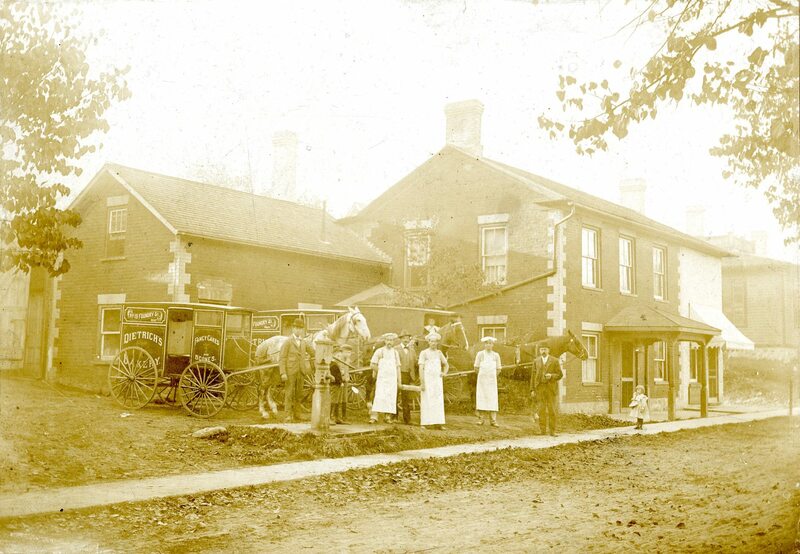 This is a photograph of the Foundry Street location of Dietrich Bakery in Berlin (now Kitchener), ca. 1899. 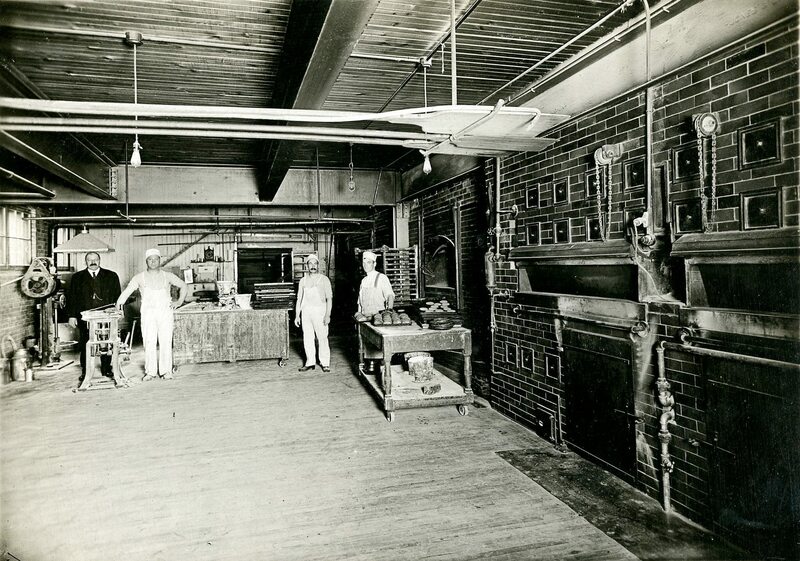 The above image is of the oven room of the Dietrich Bakery on King Street East. Henry A. Dietrich, owner, stands in business suit to the far left. 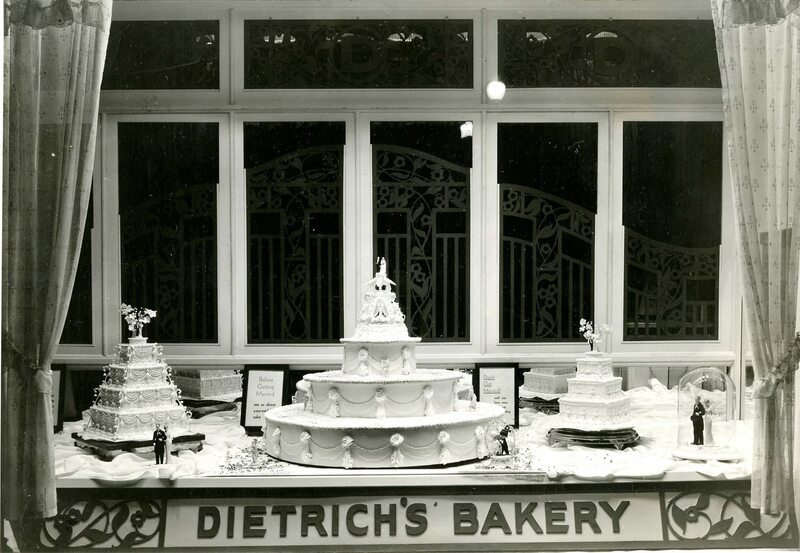 Dietrich’s Bakery was established in January 1899 by Henry A. Dietrich in Berlin. He opened his first bakery on Foundry (now Ontario) Street. The location of the bakery had changed to 86 King Street East in the 1901-1903 city directory. By 1917, the Dietrich Bakery was producing over 1,000,000 loaves annually. The bakery operated for many years at King and Scott Streets, where the Eaton’s Department store was once located. Dietrich’s Bakery was known for its bread and cakes. Henry Dietrich sold his bakery in 1946 to Weston’s, which now operates a large plant on Victoria Street. In a 1973 Waterloo Historical Society article, Sandy Baird recalled growing up near the Dietrich Bakery and its “calorie-packed fragrance” with fond memories of the installation of their donut making equipment. 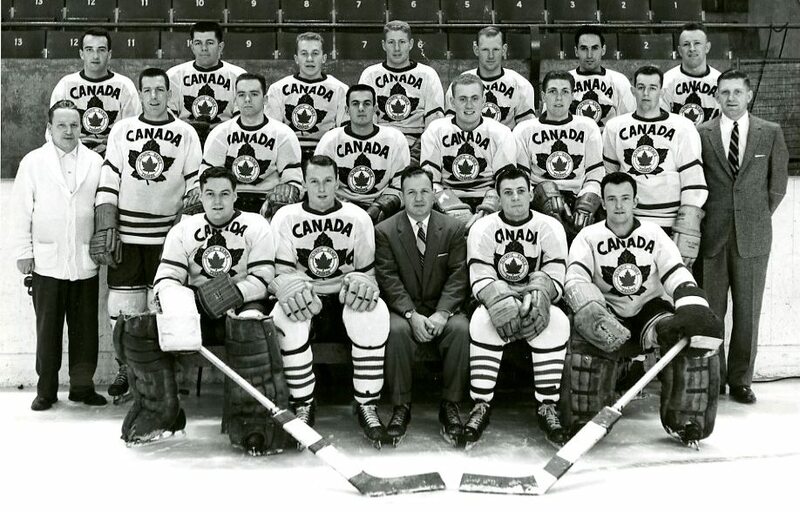 As we savour the recent gold medals in men and women’s hockey at the Olympics held in Sochi this month, I thought that it would be a good time to look back to one of Kitchener-Waterloo’s Olympic hockey connection – the 1956 K-W Dutchmen Hockey team. The Dutchmen represented Canada at the 1956 Olympics held in Cortina, Italy, winning the bronze medal. Russia won gold, while the United States won silver medals. The 1960 K-W Dutchmen hockey team represented Canada at the Olympics in Squaw Valley, California and came home with silver medals . CBC-KW profiled the 1956 and 1960 K-W Dutchmen teams on their website, including video of a 1955-56 CBC broadcast about the team and this area. In the Record, Jeff Outhit recently wrote an article about Byrle Klinck’s memories of the 1956 bronze medal team. The photo above was taken by the Kitchener Daily Record. Appearing in the photograph, front row, from left to right, are: Keith Woodall, Jack McKenzie, Bob Bauer (coach), Ken Laufman and Denis Brodeur. Second row: Harry Wharmsby (trainer), Art Hurst, Paul Knox, Gerry Theberge, Bob White, Byrle Klinck, Jim Logan and Ernie Goman (manager). Back row – George Scholes, Floyd Martin, Bill Colvin, Charlie Brooker, Jim Horne, Don Rope and Howie Lee. There are so many great hockey memories from Waterloo Region. What is your best hockey memory or story? I am pleased to have recently received a copy of “Sparks from the Perrin-Church Family Anvil” in the Grace Schmidt Room by J.E. Perrin. It tells the story of the family of Alexander A. Perrin (1877-1962), a well-known Kitchener photographer, and his wife Mary Priscilla “Lill” Church (1877-1932). Originally from the Merrickville and Smith Falls areas of Ontario, Alex and Lill moved to the United States where Alex learned the photography trade from his uncles and later operated a studio in Batesville, Indiana. In 1909, they moved their young family to Berlin, where Alex operated another successful portrait and commercial photography studio. He had several studio locations, the most well known being, 155 Wellington Street North, Kitchener. Four of the Perrin’s eight children were born in Berlin/Kitchener. Alex was predeceased by his wife Lill in 1932 and later married Faye Kropf. He passed away on 20 December 1962. His camera was donated to Doon Heritage Crossroads, now the Region of Waterloo Museum. The book is filled with informal family photos, as well as formal portraiture. It is a rich record of the many recollections and memories of family gatherings, birthdays and events of a very photogenic family. If you are in the GSR, please be sure to stop by and have a look! It’s time to roll out the barrel for Oktoberfest! MC60P563 (KPL Collection) Oktoberfest keg tapping, 1969. Reproduced with the permission of the Waterloo Region Record. As Oktoberfest starts today, this image of the 1969 keg tapping made me think how much Oktoberfest has changed and evolved. If you consider its genesis from a small local cultural celebration to the 9 day extravaganza of activities, events and locations today, Oktoberfest has certainly grown with the community. What also struck me was the size of the barrel used the the 1969 keg tapping – clearly not the same size of the keg of today! This image appeared in the 15 October 1969 edition of the Kitchener-Waterloo Record and is part of the MC60 Kitchener-Waterloo Chamber of Commerce Collection in the Grace Schmidt Room. 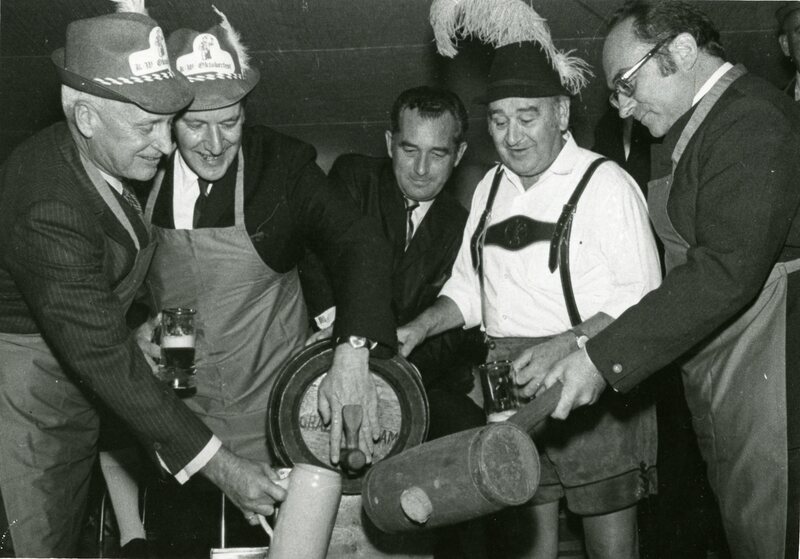 From left to right, Kitchener Mayor Sid McLennan, Waterloo Mayor Meston, Formosa Springs Brewery President, Harold Blakley, Concordia Club Manager, Julius Rauchfuss, and Munich Tourism director, Dr. Otto Hiebl, take part in the tapping of the keg at the 1969 opening ceremonies.